Description This chapter describes the dermscopy of psoriasisThis glossary term has not yet been described. Psoriasis Psoriasis – cite! Psoriasis (message) Psoriasis – participate! Dotted vesselstiny pinpoint vessels represent the most frequent dermoscopic feature of PsoriasisThis glossary term has not yet been described., being present in every single psoriatic plaque. Detection of any other morphologic type of vesselsThis glossary term has not yet been described. excludes the diagnosisis the identification of the nature and cause of a certain phenomenon. Diagnosis is used in many different disciplines with variations in the use of logic, analytics, and experience to determine "cause and effect". In systems engineering and computer science, it is typically used to determine the causes of symptoms, mitigations, and solutions of PP. The term “red globulesThis glossary term has not yet been described.” has also been used to describe the same dermoscopic feature. Distinction between dots and globules is based on the diameter of the structure (dots are smaller), and it is important in dermoscopyThe examination of [skin lesions] with a 'dermatoscope'. This traditionally consists of a magnifier (typically x10), a non-polarised light source, a transparent plate and a liquid medium between the instrument and the skin, and allows inspection of skin lesions unobstructed by skin surface reflections. Modern dermatoscopes dispense with the use of liquid medium and instead use polarised light to cancel out skin surface reflections. of melanocyticThis glossary term has not yet been described. tumors. In psoriasis, both terms may be used, since the roundish vascular structuresThis glossary term has not yet been described. can be of various diameters, although they are usually of similar size within a given lesion. Under higher magnifications (x100-x400), the psoriatic vessels appear as dilated, elongated, and convoluted capillaries. Histopathologically, red dots correspond to the loops of vertically arranged vessels within the elongated dermal papillae. Important for differential diagnosis, the uniform distribution of the red dots within the lesion represents the dermoscopic hallmark of psoriasis. Dotted vessels may be detected in several inflammatoryThis glossary term has not yet been described. dermatoses, but no other disease exhibits the symmetrical and homogenous arrangementThis glossary term has not yet been described. of vessels all over the lesion that characterizes psoriatic plaques, unless thick superficialThis glossary term has not yet been described. scales cover them. 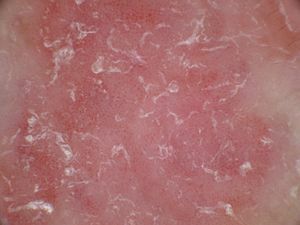 Scales removal will bring to light the characteristic vascular pattern of psoriasis, possibly together with tiny red blood drops, which can be characterized as the dermoscopic “Auspitz sign”. 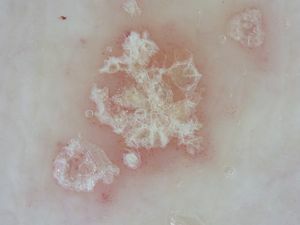 A specific feature for the diagnosis of psoriasis is the sign of red globular rings, described by Vazquez-Lopez et al. If present, the red globules are arranged in irregular circles or rings. But even if highly specific, this sign is only seen in a minority of psoriatic lesions. Other types of vessels distribution are extremely rare in psoriasis. In addition, light red background color and white superficial scales are two common dermoscopic criteriameasure of how well one variable or set of variables predicts an outcome of plaque psoriasis. In differential diagnosis of erythematosquamous dermatoses, scale color is of particular value: Yellow scales are a negative predictor of plaque psoriasis, therefore argueing for the presence of dermatitisalso known as eczema is a group of diseases that results in inflammation of the skin..  Dermoscopic findings of psoriasis may vary dependent of the body sitedescribes the area of the body and the various amounts of scaling. In psoriatic balanitis and inverse psoriasis lesions that lack scaling, the regularly distributed red dots are prominent. Contrariwise, in scalpThis glossary term has not yet been described. or palmoplantar psoriasis, thick hyperkeratotic plaques hide the typical vascular structures, which may be recognized after removal of the scales. Regular dermoscopic examination is of avail in patients under treatment with topical steroids or systemic biological agents, because additional morphologic information might be helpful for early detection of a relapse. Additionally, steroid-induced skin atrophy is earlier detected by dermoscopy (by revealing characteristic linear vesselsLinear mildly curved vessels considered irregular when different sizes shapes and curves with a haphazard or random distribution are presented and considered regular when short and fine (thin) linear vessels prevail various diagnoses) than in the clinical setting. ↑ 1.01.11.21.3 Lallas et al. : Accuracy of dermoscopic criteria for the diagnosis of psoriasis, dermatitis, lichen planus and pityriasis rosea. Br. J. Dermatol. 2012;166:1198-205. PMID: 22296226. DOI. ↑ Vázquez-López et al. : Dermoscopic features of plaque psoriasis and lichen planusThis glossary term has not yet been described. : new observations. Dermatology (Basel) 2003;207:151-6. PMID: 12920364. DOI. ↑ De Angelis et al. : Videocapillaroscopic findings in the microcirculation of the psoriatic plaque. Dermatology (Basel) 2002;204:236-9. PMID: 12037454. DOI. ↑ Vázquez-López et al. : A dermoscopy subpattern of plaque-type psoriasis: red globular rings. Arch Dermatol 2007;143:1612. PMID: 18087028. DOI. ↑ Kim et al. : DermoscopyThe examination of [skin lesions] with a 'dermatoscope'. This traditionally consists of a magnifier (typically x10), a non-polarised light source, a transparent plate and a liquid medium between the instrument and the skin, and allows inspection of skin lesions unobstructed by skin surface reflections. Modern dermatoscopes dispense with the use of liquid medium and instead use polarised light to cancel out skin surface reflections. can be useful in differentiating scalp psoriasis from seborrhoeic dermatitis. Br. J. Dermatol. 2011;164:652-6. PMID: 21155753. DOI. ↑ Vázquez-López & Marghoob: Dermoscopic assessment of long-term topical therapies with potent steroids in chronic psoriasis. J. Am. Acad. Dermatol. 2004;51:811-3. PMID: 15523365. DOI. This page was last modified on 4 December 2018, at 22:22.